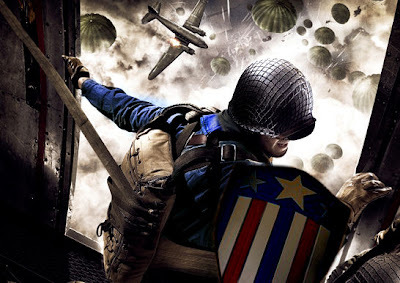 As we've known for sometime 'Captain America' will be mainly a period piece set during WWII. Director Joe Johnston reveals that a shooting location has been set in the UK and filming will begin at the end of June. Considering the film is set during WWII, it is a no brainer on this choice. The film will be shot in HD (recently seen in Public Enemies). Johnston states that shooting in High Definition was a decision made to interpret the more current comics. I'm not so sure I like the idea at all. High Definition cameras seem so sharp and clear and in a period piece set during WWII, I am a tad reluctant. Marvel may also choose to transfer the film to 3D after production has wrapped, but no definite decision has been made at this date. As far as casting is concerned, director Joe Johnston did not reveal any of the names who have been tested for the role of Steve Rogers a.k.a. Captain America. He did reveal however, that a full cast list must be finalized by March 1st. He also got a little bit more specific saying that the powers that be have narrowed it down to 6 individuals. Their ages range from 23 to 32 and all of them are relatives unknowns. Their plan is to surround Captain America with bigger name actors. 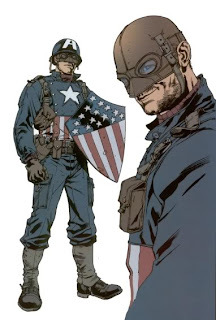 There has been plenty of speculation and hope concerning the Captain America costume and just how Marvel and Joe Johnston were going to work out a uniform that is essentially one huge American Flag. Johnston addressed the very issue with the Los Angeles Times, he explains that initially Captain America will be a USO performer much like Bob Hope or more recently Kid Rock. You might be saying to yourself, what the hell?, But Johnston makes sense of the idea in his statement. He said, "After he's made into this super-soldier, they decide they can't send him into combat and risk him getting killed. He's the only one and they can't make more. So they say, 'You're going to be in this USO show' and they give him a flag suit." Johnston explains further that Steve Rogers wants no part of the charade that he is being used as and instead goes AWOL. Johnston told the L.A. Times, "He's up on stage doing songs and dances with chorus girls and he can't wait to get out and really fight. When he does go AWOL, he covers up the suit but then, after a few things happen, he realizes that this uniform allows him to lead. By then, he's become a star in the public mind and a symbol. The guys get behind him because he embodies something special." Joe Johnston went on to explain there will be two costumes within the film. One that is very old school conveying the original artwork of Jack Kirby and another than will be far more modern or combat ready. Johnston once again explains, "He realizes the value of the uniform symbols but he modifies his suit and adds some armor, it will be closer to the Cpa costume in some of the comics in more recent years . . . this approach, it's the only way we could justify ever seeing him on a screen in tights, with the funny boots and everything. The government essentially puts him up there as a living comic-book character and he rips it off and then reclaims some of its imagery after he recognizes the value of it. We think it's the best way to keep the costume and explain it at the same time." I really got to hand it to the people brainstorming behind closed doors on this movie. They know what they are doing and are really putting a magnificent amount of leg work to make sure Captain America is not sullied. Well all of this talk about Captain America and his suit has me wondering just who will he be suiting up to take on. Will Captain America have central villain or will it just be the entire War. AICN ran a update coming from "The Wolfman" press junket that will get Cap's fans really excited! 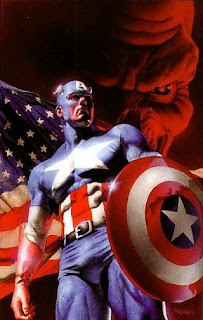 I am pleased to report that the Red Skull will be in "The First Avenger: Captain America." It gets better! The Invaders will also have a major stake in the film! Devin Faraci over at CHUD spoke with Joe Johnston and he explained that the Invaders will "be in the entire second half." Johnston also told Faraci that the Invaders will have 6 members. Head over to CHUD to see who Devin Faraci guesses may appear. Strong money says Union Jack and his daughter Spitfire along with possibly the original Human Torch (not the one more commonly known and featured in the Fantastic Four), but that is only 3 members, so there is quite a bit of speculation. The original core members included Union Jack, Spitfire, Namor and The Human Torch who aligned with Captain America and his side-kick Bucky Barnes. While all of this Captain America news may seem a bit overwhelming at first, the lasting effect is real excitement. It is clear that Marvel is taking care with the Captain property and are doing it a real justice. Stay tuned as more "The First Avenger: Captain America" scoops break. awesome, thanks for assembling this all in one place. much easier to read than all the broken tidbits we're getting everywhere else!